Source: Greenwich Graphic. Saturday, April 11, 1903. Putnam Cemetery, Parsonage Road, Greenwich. First. I order and direct my executrix herein after named to pay all my just debts and funeral expenses as soon after my decease as may be practicable. Second. 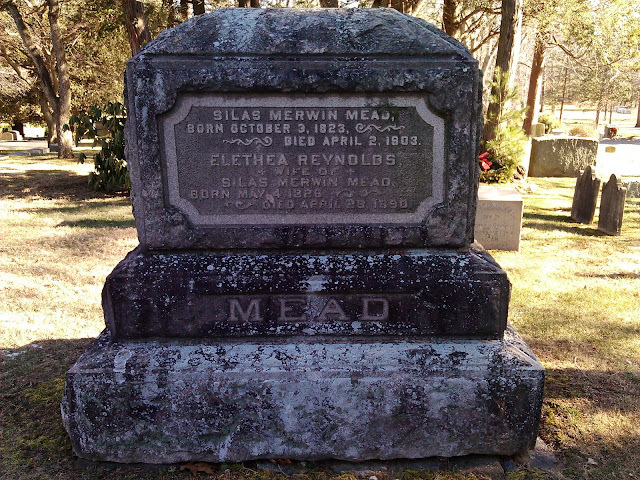 I give and bequeath to my daughter Anna R. Mead, wife of Nelson B. Mead, the sum of five hundred ($500) dollars. Third. All the rest, residue and remainder of my estate of whatever kind or nature, whether real or personal, I direct my said executrix to sell and convert into money. Fourth. And of such remainder or the avails thereof, I give and bequeath as follows: Four twentieth thereof to the Congregational Home Missionary Society of the City of New York. Three twentieths thereof, to the American Board of Commissioners for Foreign Missions. One twentieth thereof, to the American Missionary Association of the city of New York. And, whereas the Ecclesiastical Society of the Congregational church of New Fairfield in said County of Fairfield has within the last few years suffered the loss by fire of its parsonage. If at the time of my deceased its society shall not than have a parsonage of its own, then I give and bequeathed to said society three twentieths of such remainder to be applied as followed: two thirds thereof, to go towards the building of such new parsonage, and the remainder of such legacy is to be used towards the improvement of a tract of some ten acres where the parsonage formally stood. And it is my wish that the said society or the members thereof should contribute an amount equal to this legacy to be expended for the same purposes. If however at the time of my decease said society shall then have a parsonage of its own, then and in that case instead of three twentieths of such remainder, I give and bequeath to society, one twentieth part of such remainder to be applied in the improvement of said ten (10) acre tract above referred to. Fifth. All the residue of my estate including any elapsed legacies I give and bequeath to my daughter Mary Louise Brush wife of Alexander B. Brush, of said New Fairfield, to her and to heirs and assigns forever. Lastly I do hereby nominate, constitute and appoint my said daughter Mary Louise Brush to be the executrix of this my Last Will and Testament and direct that no bond be required of her for the settlement of my estate. I hereby revoke, cancel and annul any and all form by me made. In Testimony whereof I have hereunto set my hand and affixed my seal at said Greenwich, this thirtieth day of January, A. D. 1902. Signed, sealed published and declared by the above named Testator as and for his Last Will and Testament in our presence and we at his request, in his presence, and in the presence of each other have hereunto subscribed our names as witnesses. ELSIE M. DECKER of South Norwalk, Conn.
F.A. HUBBARD of Greenwich, Ct.
GEORGE G. MCNALL of Greenwich, Conn.
Scores of people are visiting Mead's Stationery Store to see the two mammoth $15,000 historical paintings,"The Birth of the Flag" and "Ring! Ring for Liberty" by Henry Mosler, which are on exhibition there. The paintings are probably the finest that have ever been on exhibition in Greenwich. The first painting shows Betsy Ross and three other young women engaged in making the first American flag. The coloring, lighting and perspective are wonderful. 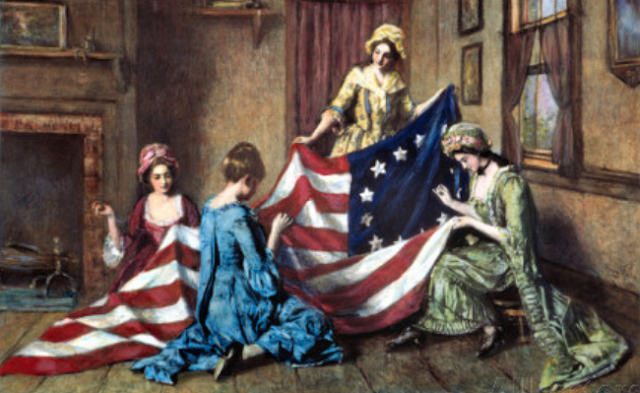 It was Betsy Ross who made the first flag of the United States, and she made flags for the government for several years. The first flag was made in the little Arch street house in Philadelphia, which still stands; and it was ordered of Betsy Ross, in May, 1777, by a Committee of Congress, consisting of George Washington, Robert Morris and Colonel Ross. It is a scene of supreme significance to our country that Mr. Mosley has chosen for his great painting and the picture is a fitting companion for Mr. Mosler's "Ring! Ring for Liberty." In that picture the old bell ringer, in the cupola of Independence Hall, showed what the men of the Colonies had done to determine the destiny of the nation. This pairing portrays the part the women played. Mr. Mosler has addressed himself to the subject with his accustomed intelligence and with real affection. He based his work on careful sketches made in the Betsy Ross House, and on through historical research. The scene lives for us, on the canvas, as only the genius and imagination of a great painter can replicate it. Which, please God, shall never die! The painter of "Ring! Ring for Liberty!" and "The Birth of the Flag" was born in New York City, June 6, 1841, and has enjoyed an artistic career of great distinction. He studied first in Cincinnati under the tutelage of James H. Beard. He served through the Civil War as a staff officer, and made many sketches and drawings of the scenes of engagement in which he took part. After that he worked for year or two in Dusseldorf, under Mucke and Kineger; also under Wagner in Munich. He spent some time, likewise, in Paris, under the instruction of Herbert. As early as 1874 Mr. Mosley won a medal at the Royal Academy of Munich, and this was followed by many medals and other prizes in Europe and America. He was made a Chevalier of the Legion of Honor in 1892. He won the distinction of obtaining the Thomas B. Clark prize of our National Academy of Design, in 1896, and has received many signal tokens of distinction since that time. He came to be known as one of the leading American artists who, in addition to his masterly skill, revealed a ready sympathy for the people at a strong national feeling. This is found expression in a number of distinguished paintings of an historical and patriotic character, of which the present paintings are the most notable. Mead's store have several fine reproductions of the paintings for sale.